Folks, it has been a while. Let’s look in on Patty…. Patty stared at her new Apple® Watch and was pleased. What was most pleasing is that she didn’t expect to be pleased. She heard many lukewarm reviews, and was prepared to be unimpressed. But, so far she was loving it. Admittedly, it needed her iPhone 5 nearby. But, with a glance she could see text messages, her fitness progress for the day, the outside temperature, her meetings for the day, use the watch's calculator, etc., etc. She was using it all of the time. It was just more convenient than getting her iPhone out of her pocket book. In addition, battery life was much better than expected. At the end of a day she still had two thirds of the charge left. She chuckled to herself as she looked at the watch band. Watch bands had been around for decades and have that annoying pin that secures the band to the watch. 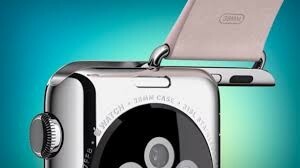 Leave it to Apple to design the perfect watch band. There is a little indentation on the back of the watch. If you press it in, the band slides out. When reinserted, the band is held very strongly. But, the best thing about the watch was that it was free! The class professor asked her to give a 30 minute presentation on the Apple Watch at a class called Everyday Technology. As an honorarium the watch was paid for by the school. And she got to keep it. The Apple Watch Band is easy to change and is robust. Image source. This was Patty’s off term, so she also agreed to give a lecture at another class, Materials: The Substance of Civilization, as the course prof was at a conference for a few days. It made Patty feel good that she was so well integrated into the engineering school’s culture that these two profs would ask her to participate in their classes. Part of her lecture was on Mendeleev’s development of the Periodic Table. The class prof suggested that she consider using a 10 minute video vignette from Stephen Hawking’s Universe DVD. The video discussed how Mendeleev wrote the atomic weight and the element’s name on a piece of paper about the size of a card. He then organized the elements according to their atomic weight and physical properties and the result was the Periodic Table. As Patty watched the video, she saw the actor placing the card of the element indium. She was becoming quite interested in indium because her husband Rob was doing his PhD thesis on indium tin oxide (ITO) . She did a little searching and found that indium was discovered in 1863, six years before Mendeleev performed his groundbreaking work on the periodic table. So the video was correct after all. Mendeleev around the time of his discovery of the Periodic Table. 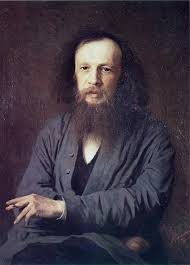 As the video went on, the narrator pointed out that Mendeleev’s first Periodic Table had gaps and that Mendeleev predicted that in time, elements would be discovered that would fill these gaps. Patty found a TedEd video that she thought explained Mendeleev’s work even better than the Stephen Hawking video. One of the things that Patty thought to be really profound was that Mendeleev predicted the properties of the unknown elements by their place in the Periodic Table. The video points out that he predicted an element with an atomic mass of about 68 would be found. He called this element eka-aluminum as it was in the same period and one row below aluminum. In 1871, he predicted that it would have a density of 6 g/cc, melt at a low temperature, conduct heat well and be a shiny metal. All of these traits he predicted with uncanny accuracy, when eka-aluminum or gallium was discovered just four years later in 1875. 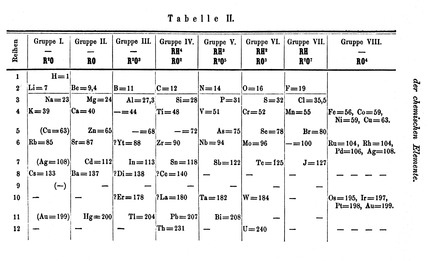 Mendeleev's 1871 Periodic Table. This was before atomic numbers were known, so he used atomic mass. Image source. Note that atomic weight of 68 has no element. Gallium would be inserted here in 1875. Patty was familiar with gallium as Rob’s studies included the element, as it is often used with indium in the manufacture of semiconductor lasers and LEDs. She vaguely recalled Rob being excited about the importance of gallium, but couldn’t quite remember why. The day passed quickly and, before she knew it, she was in her driveway, ready to see what adventures the evening held. Rob had arrived early and was making his signature dinner of homemade mac and cheese. It was the crispy kind and Patty smelled the inviting aroma as she entered her home. Dinner, and shortly after, was family time. Rob and Patty had an agreement that they would minimize work talk and concentrate on family things with their two young boys. It was Tuesday, which was Spanish day at their home. On Spanish day they only spoke Spanish. Already their twin sons were speaking and understanding Spanish and Mandarin (Thursday was Mandarin Day) quite well. By 8PM the boys were in bed and Patty was bursting to tell Rob about Mendeleev and eka-aluminum. After she told him the entire story she continued. “I still think it is really impressive that Mendeleev was not only able to predict that gallium must exist, and that he came so close to describing its actual physical properties,” Patty opined. “I agree. Think about it. When he made the prediction almost nothing was known about materials. Scientists didn’t even agree that atoms existed. You and I have had solid state physics courses and we probably couldn't do what he did,” Rob replied. “Gallium is an extremely important material right now as it is used in semiconductor lasers and especially LED lighting. Without gallium we couldn’t have white LED lighting - as gallium nitride is required to make blue lasers,” Rob went on. “Wait a minute! You said white light, then blue light, I’m confused,” Patty interrupted. “There are no white light LEDs. White light can only be produced from red, green, and blue LEDs. Blue LEDs are made with gallium nitride,” Rob answered. “I know white LED lighting is important for the future as it conserves electricity. But, I haven’t liked the harsh blue-white light of early LED lights. However, the technology is improving,” Patty responded. “I read that about 20% of all electricity is used for lighting and that LEDs use about 1/7th the energy per lumen that incandescent lights use. If you think about this situation, gallium is an important material of the future,” Rob went on. “I wonder if Mendeleev would have guessed that his predicted eka-aluminum, aka galliuim, would be so important,” Patty chuckled.